Annual schedule from April 2018 to March 2019. Listed below are exchange programs and events that will take place during the school year. The University would like you to get used to your University life as soon as possible. We would also like to allow time for you to get to know the President of our University and all other faculty and staff members so that you can enjoy and have an enriching campus life during your stay here. Please participate in these programs and have fun. 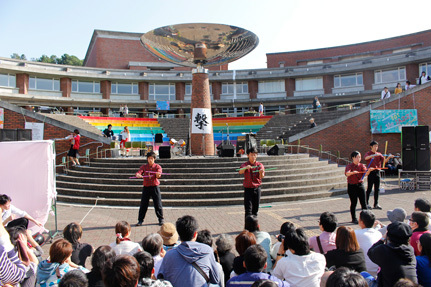 There will be events such as the University festival (the Tsurugi-sai)，sport festivals and a welcome party for new students. Every year our University is requested by the community to hold some exchange programs，which is an essential part of your overseas studies. These programs will be posted on the “Web Service system” and the bulletin board so please take note of them and participate in these programs. Our University has an International Friendship Club called “IFC”. This club makes plans for you to participate in the University’s activities such as the University festival and also plans trips, sports, arrties with ethnic foods and other events. 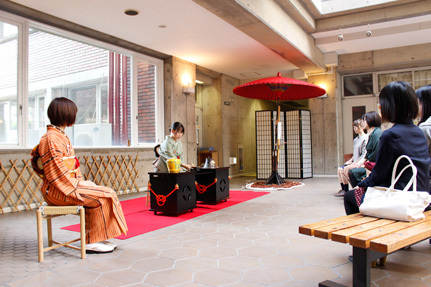 "Tsurugi-Sai" university festival is held in autumn. Come and join our festival!